Here is a picture of two Children of Haitian descent as they are being deported from the Bahamas. These children are not Haitians and have never been to Haiti. They were born in the Bahamas from Haitian families who are in the country illegally. 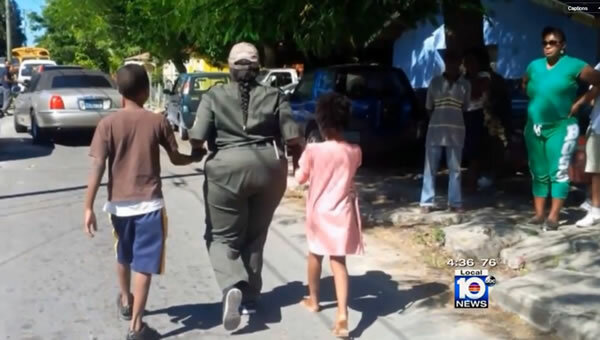 Children Of Haitian Descent Handcuffed Deported From Bahamas. While viewing the images of the children of Haitian descent, being sent cuffed to ordered out of the Bahamas, Daphne Campbell, a Democratic member of the Florida House of Representatives, has given her strong response to the act. She has condemned it as unfair, injustice and cruel. Punishing an innocent child whose only knowledge is that of the Bahamian soil, and separating him from own family and deported to another country which he has never seen, is totally inhumane. This new policy attempt by the Bahamian authority to curb illegal immigrants in the country, has caused much dissent among the Haitian activists. As per Campbell's statement, until something is done to resolve the issue, all industries should ban the Bahamas. These innocent children probably feel humiliated as they are walking and apprehended by an immigration officer in the Bahamas. They have become the center of attention as the many in the neighborhood are stopping what they are doing to watch. As I recollect, It their age, I was very proud and this would have been devastating to me.